, a free event open to the public, and one of only a dozen Open Streets locations in all of California! What are Open Streets? Public streets are temporarily closed to motor vehicles, so people of all ages and abilities may use them for walking, biking, and other people-powered transportation, plus dancing, playing, and socializing. Visitors and locals alike will celebrate Monterey County&apos;s second Open Streets date, the November 1st Ciclovía Salinas, "Where the streets are yours - ¡Donde las calles son suyas!" A 1.6-mile stretch of Salinas streets will again be closed to motor vehicles, and opened for walking, biking, running, skateboarding, rollerblading, and the like. Do you roll in a wheelchair? Do you bike or walk with children or unsteady elders not at an age to be sharing streets with cars? Ciclovía Salinas allows these and others, all ages and abilities, to feel right at home on the streets of Salinas, the Monterey County seat and its largest city. Free bicycle valet parking will be available, and the valets are happy to accept strollers, joggers, and bicycle trailers as well. That makes it easier for anyone who wishes to visit a neighborhood taqueria, unique gift shop, or other business, or to participate in free activities along the Ciclovía route. Featured will be open-air zumba and other fitness classes, a bike decorating contest, live entertainment, art, informational booths, and more, with a special area for young children too. Since the first Ciclovía in Bogotá, Colombia in 1976, Open Streets are growing in popularity, due to their personal and planetary benefits. Most of Tips for Bicycling Monterey County&apos;s "Why bike Monterey County" reasons apply to Ciclovía Salinas, whether you&apos;re biking or experiencing it another way. Not least of all, it will be fun! 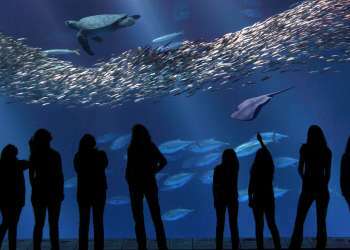 And it happens just 20 miles from the waters of the Monterey Bay. Saturday, November 1, 2014, beginning at 10 a.m. The event winds down on the east end of the route at 1:30 p.m., concluding on the west end at 2:00 p.m. The route is 1.6 miles of Alisal Street, between Salinas Street in the Oldtown Salinas/downtown area and Sanborn Road in East Salinas/the Alisal. A very few intersections along the route will be open to motor vehicles, with uniformed officers directing traffic. All other intersections will be closed to vehicles, with barricades staffed by police-trained adult volunteers. Check out the Ciclovía Salinas Open Streets etiquette, provided in English and Spanish, at http://www.openstreetsproject.org/salinas. There you&apos;ll also find any event updates, and other details. Ciclovía Salinas is a place for everyone eager to know the full array of culture in Monterey County. You&apos;ve likely eaten many meals that began as fresh produce from the Salinas Valley, Salad Bowl of America. At Ciclovía Salinas, you&apos;ll have the chance to chat with some of the individuals who help bring food from field to table, year after year, along with performing artists, government leaders, and "the kids next door" and their parents. Besides English being spoken, a delightful flow of conversation can also happen for Spanish-speaking visitors, linguistics students, and other language enthusiasts. Salinas has a predominately bilingual population (67% of residents age five or older speak a language other than English, usually español). This vibrant, family-friendly scene plays against a backdrop of the Gabilan Mountains, the mountain range of Nobel-winning author John Steinbeck&apos;s Of Mice and Men, East of Eden, and The Red Pony. Ciclovía Salinas is a place to begin discovering, as Steinbeck did, the pleasures found in the diverse neighborhoods of Salinas. Many people are unaware there are 95 miles of connected bikeways throughout Salinas, from the Alisal to Creekbridge to Oldtown to Santa Rita, and more. Bicycling Salinas is growing in popularity because of its many flat, wide streets, often in low-traffic areas. Besides bike lanes and signed routes, you&apos;ll find some bike paths too (best for children and other less experienced riders), including through Natividad Creek Park. As usual, brush up on CA bike laws and safety tips before riding. 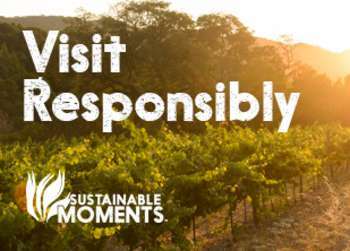 To explore by bicycle, bring your bike or arrange an all-day rental on the Monterey Peninsula (20 miles away). At this time, there are no bike rental locations in Salinas. Savvy Steinbeck lovers know that if you&apos;re looking for Steinbeck, you don&apos;t stop with Monterey&apos;s Cannery Row. You also go to the heart of Steinbeck Country, Salinas. On November 1, 2014, after Ciclovía Salinas concludes at 2 p.m., there&apos;s still time to continue exploring Salinas: the Steinbeck House, John Steinbeck&apos;s birthplace and boyhood home, will be open until 3 p.m., and the National Steinbeck Center until 5 p.m. Those are just more good reasons to mark your calendar for November 1st! Once you reach the Ciclovía route though (Alisal Street between Salinas Street and Sanborn Road), be ready to leave motor vehicles behind. 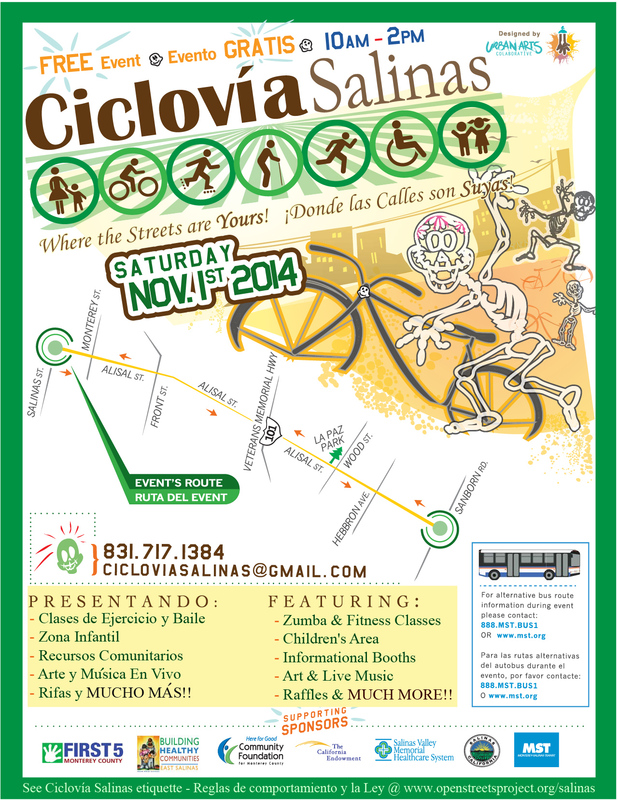 For four hours, be part of America&apos;s car-free, carefree ciclovístas!